Commercial landscaping can be an important part of your business. If you take a lot of clients in-office, the landscaping at your establishment goes a long way in establishing a first impression before they even walk in the door. Because your business operates all year round, it is important for your landscape to look appealing all year round, as well. With the winter season approaching quickly, we’ve put together some steps that can keep your landscape looking nice, even when the weather outside is frightful. Spring, summer, and early autumn can boast colorful blooms and bright green grasses, but these vibrant plants will go into hibernation for the winter months, leaving your landscape looking brown and dead. This time of year, most of the bright colors will have receded, giving you an opportunity to see what sections of your landscape could benefit from more greenery this winter. Small evergreen shrubs and trees require very little maintenance, so now is a good time to make an investment in durable greenery that will last you for years to come. Pruning shrubs and trees after all the leaves have fallen is one of the best things you can do for them. While the leaves are gone and the trees are “resting,” a good dormant pruning session sets them up for healthier growth in the long run. Eliminating dead branches before freeze sets in keeps your trees safer and makes them look better when spring comes around. Pruning while the plants are dormant also prevents the spreading of disease from the pruning tools, since bacteria and fungi are also dormant or dead at this time. If you aren’t sure about how much to prune or which branches should be cut away, call us at All Summer Landscaping! Old stems and leaves are easy to ignore when they’re swept away underneath shrubbery, but removing dead foliage is actually one of the most important things you can do for your plants. During the winter, organisms love to use dead foliage as a wintering spot to nest, feed on decaying bacteria, and lay eggs that will hatch in the spring. This means disease for your landscape when the weather warms up! Clear away debris this winter so organisms don’t have the opportunity to wreak havoc on your landscape in a few months. As winter approaches, it is also time to consider what you would like your landscape to look like next spring. This is the time of year to plant bulbs that will bloom and make your landscape look bright and beautiful next season. 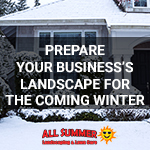 Ready to Prepare Your Business’s Landscape for Winter? We understand that you have a lot on your plate as a business owner, so putting on your gloves and landscaping your office might be the farthest thing from your mind. Call the expert landscapers at All Summer Landscaping in Murfreesboro to meet your commercial landscaping needs! We can ensure your business will stay looking beautiful through every season.